A popular shrub to small tree, Rhododendrons come in a number of varieties and are well suited for growing in gardens in the cooler areas of Australia. They are a much hardier plant than many gardeners believe, once established they are easy care in a part shaded position. Rhododendrons have long been a favourite flowering plant in the garden, and both species and cultivars are available for sale. Characterised by spectacular, colourful flowers in many forms, they are also a great foliage plant with some varieties for sale well worth growing for the large leaves alone. With a huge variety in size, from the smaller growing or ‘dwarf’ types that will reach less than 1m up to taller types that can easily reach 5m+ in height. A great selection of flower shapes, colours and leaf textures rhododendrons are a great addition to the garden. 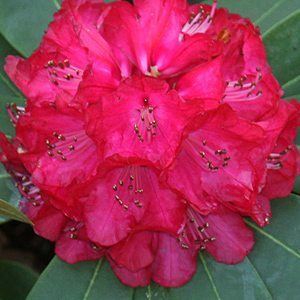 Rhododendron lochiae is an Australian species with attractive red tubular flowers. Provided with a cool root run handsome shade and these plants will thrive. Rhododendrons prefer a humus rich moist but well drained soil and some protection from and extreme afternoon sun. Heavy clay soils are not suitable and lime or wood ash should not be added to the soil. 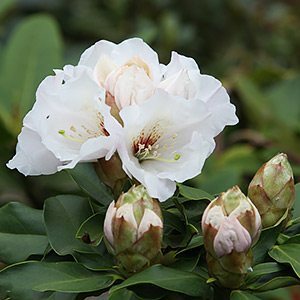 Once established they are a hardy plant, given a moist well drained soil, protection from the hot afternoon sun and hot winds, given these conditions rhododendrons do well. Remember that these plants have a fine fibrous surface roots so lots of humus rich mulch to keep them moist and cool. Pruning to keep in shape and fertilizer once a year is all the care they generally need. Encourage ladybirds and lacewings into the garden these are natural predators to many insect pests. Heavy pruning can be carried out to rejuvenate old plants, best in winter. The National Rhododendron Gardens run by Parks Victoria at Olinda in the Dandenong ranges is a great place to see Rhododendrons in flower. Pruning is generally not required – Although older plants can be hard pruned to rejuvenate. You can tip prune after flowering to help maintain a bushy habit.